Dalhousie resident Dr. Hannah Dahn has published a timely study of burnout and resiliency among residents in oncology and hematology training programs in Canada. The first of its kind in Canada, the study confirms other findings that medical residents face an extraordinarily high risk of burnout. Practical Radiation Oncology published the story online in August (print publication pending this fall) and Dr. Dahn presented her project at the Canadian Association of Radiation Oncology (CARO) annual meeting in Montreal in September. Burnout has become an important topic at Dalhousie Medical School and many other medical schools in Canada and the U.S. Dr. Dahn—a third-year resident who typically works 50 to 70 hours a week and spends about 60 per cent of her time with cancer patients and their families—wanted to learn how her fellow residents are faring. With the support of Dr. David Bowes, director of Dalhousie’s radiation oncology residency training program, Dr. Dahn reached out to 187 oncology and hematology residents across Canada through an anonymous online survey. The survey asked the residents about work schedules and sleep patterns, resiliency and wellness training, and whether they would be willing to incorporate new activities into their busy schedules to address burnout and emotional exhaustion. Thirty per cent of the residents responded to Dahn’s survey. The average resiliency score was 65 on a scale from zero to one hundred, with a higher score indicating more resiliency. In comparison, other studies have found that the average resiliency score among the general population is 80. Dahn’s results also showed that 42 per cent of the residents who responded to her survey exceeded the threshold for two key burnout indicators—emotional exhaustion and depersonalization. More than half the residents felt they had not received adequate resiliency and wellness training. Cancer is a frightening disease, with a higher mortality rate than many others. Dr. Dahn says oncologists are taught to accept that reality, but they must also learn to bounce back. “I think it’s about finding strategies to help you feel like an even-keeled ship that can’t be rocked,” she says. Dalhousie and other medical schools have begun offering group discussions, yoga sessions and lessons on meditation to help medical students and residents build their resiliency skills. Dr. Rob Rutledge, a radiation oncologist who runs cancer patient support groups, has also started running wellness sessions with oncology residents and staff physicians at the QEII Health Sciences Centre focusing on mindfulness and awareness. She tested herself by tackling a lifelong fear of heights. It may be difficult to persuade very busy, tired residents to take time out for meditation, yoga or cliff-jumping. But Dr. Dahn acknowledges it’s also difficult to convince some oncology specialists, who’ve been practising medicine for many years, that resiliency training is an important part of the curriculum. It will be a mandatory component of Canadian residency programs starting this year. Dr. Dahn will continue to promote wellness and resiliency as part of a committee assigned by Dr. Carolyn Thomson, assistant dean of resident affairs at Dalhousie Medical School. If a doctor is too tired or overwrought to listen, or explain a disease and its treatment, patients will suffer and so will the health care system. That message pertains to residents in many specialties, and also to medical students who grapple with a demanding workload and financial strain before they even know where their career will take them. Dr. Tara Dahn (left) and Dr. Hannah Dahn share more than their DNA. 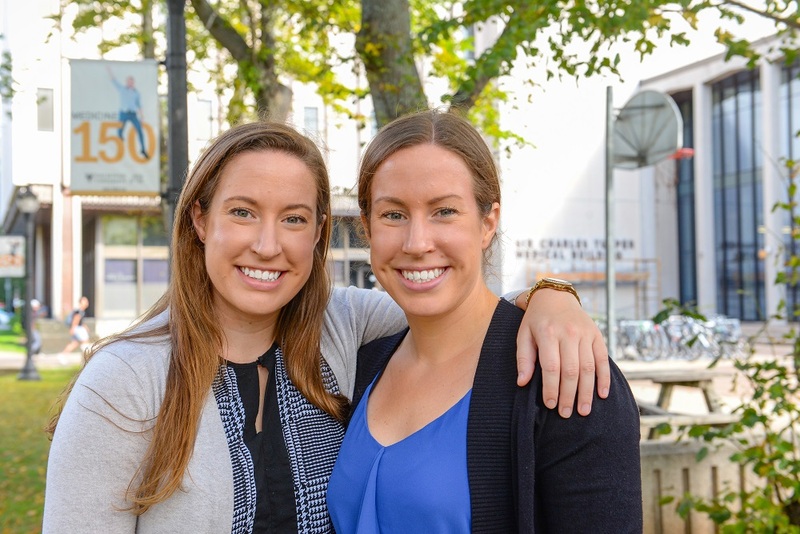 The twin sisters are graduates of Dalhousie Medical School (Class of 2016), and both are pursuing residency training at Dalhousie. While Hannah is three years into the five-year program radiation oncology program, Tara completed the two-year family medicine program and is now doing the one-year emergency medicine program. They supported each other through medical school, and now that they both work long hours in stressful fields as residents, they remind each other to take care of herself.